I moved the Google newsreader from the right side nav bar to the top just above the posts. I don't like the formatting in that it's not lining up like I want. But it's easier to read than grey on red. My question -- were any of you using it before? Should I even bother with this feature? Let me know. Also -- I'm still looking for a quality three column template that I can adopt. If you've seen one that uses the upgraded blogger, let me know where I can download it. I prefer clean lines and a grid design, but I'd look at anything that doesn't require brain surgery to implement. Lastly - I updated the ads (finally) for Stubhub. 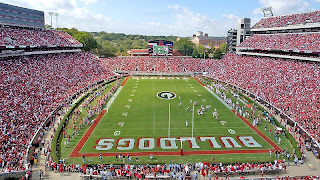 If you're planning on selling some of your Georgia tickets or looking for extras...it's never too early to consider Stubhub. never used the google reader, sorry. nope - no use here either. Dawgbone.net does a good enough job for me. FYI, I heard that UGA got a LB commit from GAC.